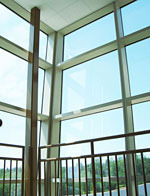 Wausau’s accessible projected windows are laboratory-proven capable of operating with one hand, using a force of 5 lbs. or less, to unlock, open, close and lock, without tight grasping, pinching or twisting of the wrist. Help ensure that fresh air and a connection with the outdoors are made accessible to people with physical disabilities, by specifying windows capable of meeting operating force and motion requirements of ICC/ANSI A117.1.